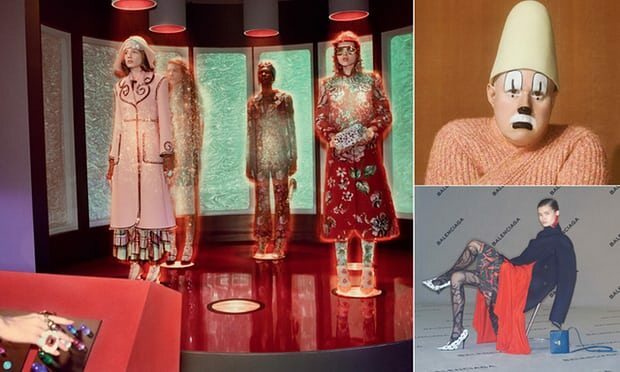 From left: inside Gucci’s spaceship, Matt Lucas for Kenzo and Balenciaga’s boardroom campaign. It’s advertising, Jim, but not as we know it. The layers of irony and cultural quotation that are the norm in fashion campaigns are so sophisticated they seem to come from another planet, far beyond mere materialism or glamour – and this autumn/winter campaign images are more bizarrely inventive than ever. Yet there is something uneasy and apocalyptic going on beyond the cleverness. In a world that has lost contact with what it thought it was, the art of high fashion may be peculiarly good at defining our numbed and astounded age. Is it too much to see an eerie vision of the US, desolated by the Trump ascendancy, in the estranged and disjointed images that promote this autumn’s lines from an archetypally American brand? In fashion, every selling season seems a new epoch in history. 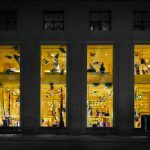 Showing this year’s models against last year’s pale and spectral Calvin Klein billboards on a road to nowhere, in an empty landscape, might seem to dangerously subvert the myth of endless novelty that fashion’s very sales depend on. Yet since last summer, everything has changed. A US president now veers between dictatorial menace and possible impeachment. What is left? Hand-me-downs, it seems. One of the models who stands in melancholy disconnection, like characters in long-shot at the end of a Michelangelo Antonioni film, has wrapped a fallen stars and stripes flag around herself as she fled whatever apocalyptic event happened further down that road. Others reflect alone, wearing high white collars like doomsday preachers. The tattered remnants of Americana are gathered up, and reinvented, as the anxious costumes of a broken tomorrow. We are all sad clowns wandering through an abstract nowhere, searching for sense. 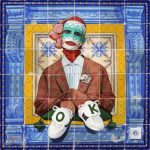 That is one possible message of Kenzo’s campaign, which pays bittersweet homage to the tragicomic cinema of Federico Fellini. Not only is the clown makeup worn by Giulietta Masina in Fellini’s 1954 film La Strada recreated in poignant portraits of models and actors, but there is a film named after Nights of Cabiria (1957). 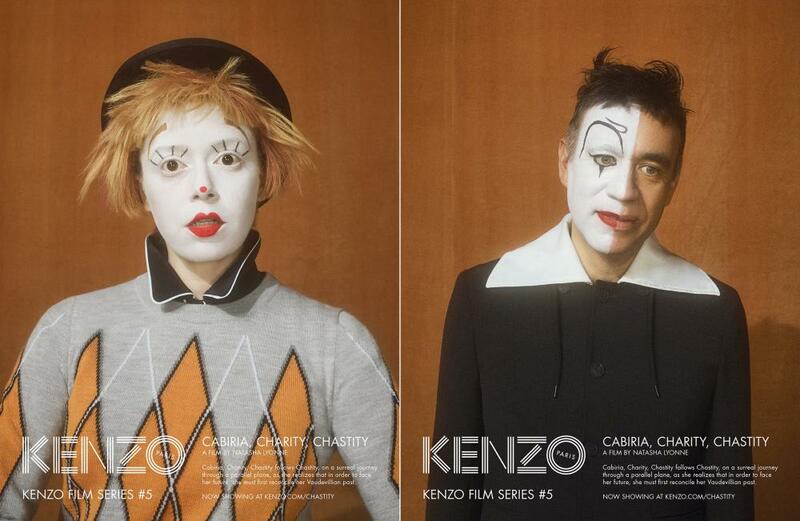 The most arresting of Kenzo’s sad clowns is Matt Lucas (main image), looking utterly bereft in a clown hat and frowning makeup. It is, of course, typical of high fashion that it can’t get enough of Fellini, who exposed the emptiness of glamour in La Dolce Vita. We’re empty and unhappy in our lives, this campaign says. Cheer us up – buy our stuff. While everyone else is fretting about the coming apocalypse, Gucci has been there, done that and come out the other side in a Ray Harryhausen time warp. It has exploded time into absurdist scenarios of rollicking good humour. Worried about the future? Let’s escape to the past’s idea of a far more entertaining future. 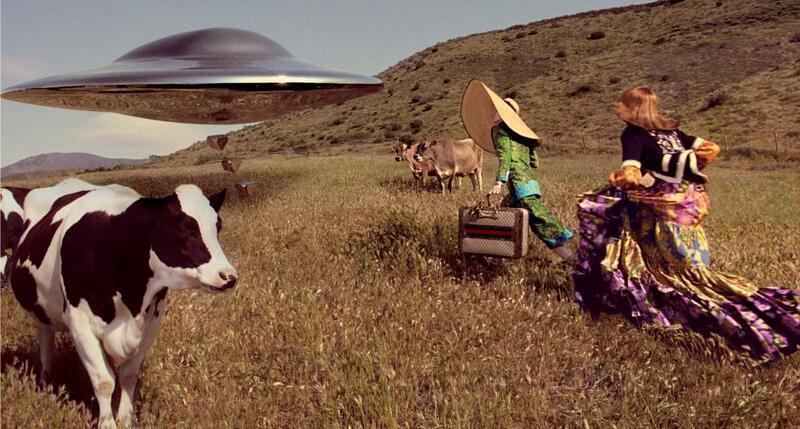 A spacecraft straight out of Harryhausen’s film, Earth vs the Flying Saucers, is montaged with delightful clumsiness into a cow pasture where two models in richly patterned, opulently coloured fabrics run towards its hovering silvery steps. Other references include Forbidden Planet and Creature from the Black Lagoon. They are ready to fly to any alien planet that does not have Trump as president. Probing? Whatever, it can’t be worse. Gucci gets it right, avoiding miserabilist pretension yet capturing the escapism of an age when people genuinely have something to escape from. Who knows, perhaps aliens will save us. With a radicalism so daring it is like a diamond bullet through my forehead, Balenciaga eschews the works of Antonioni or Fellini, apocalyptic roads or the Creature from the Black Lagoon and simply shows, er, clothes. Clothes? What have young women wearing dramatically matched and contrasted finely crafted garb got to do with fashion? Oh yeah … of course. It’s all about the clothes, against a deliberately mundane backdrop (carpet lining, perhaps?) and using one prop (a chair). And what nice clothes they are, in dazzlingly strong and subtle hues and shapes that are never conventional yet never less than seductive. 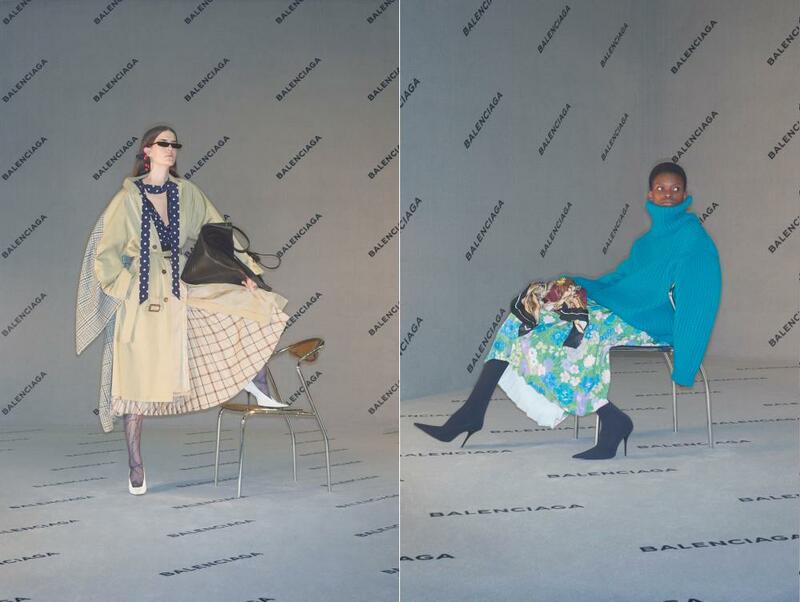 The world may be headed into the toilet, but Balenciaga just wants you to look good for it. You thought Gucci was in a time warp? Apparently Mario Testino hasn’t left his penthouse since 1995. At least, that’s how it looks from this golden, glittering, sensual picture of Edie Campbell in the back of a luxury car. Neither Testino nor Kors are aware of the financial crash a few years back, the rise of Jeremy Corbyn or anything else that has happened to shake the world of ostentatious wealth. Or perhaps they know and don’t care. Given that designer clothes are expensive luxuries (however artily they are disguised as youth culture), there is a certain admirable honesty to a campaign that sells gold and glitz and conspicuous consumption with Testino’s simple enjoyment of the high life. Live it up, like it’s Havana on new year 1959. This entry was posted in Art Reviews., FASHION and tagged Article, Balenciaga, Calvin Klein, Fashion, Features, Gucci, Jonathan Jones, Kenzo, Michael Kors, UK Fashion. Bookmark the permalink.